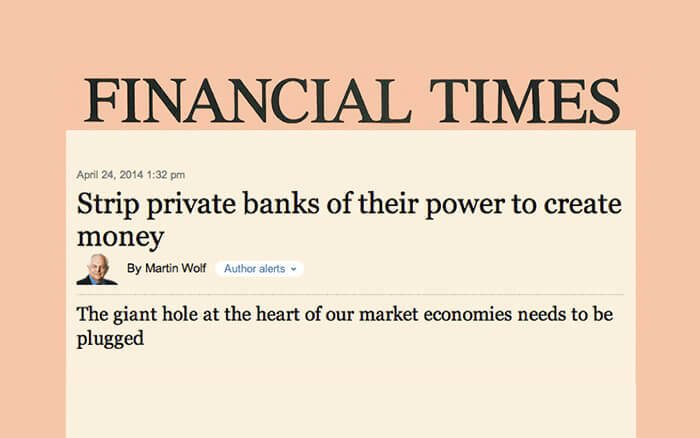 "Strip private banks of their power to create money" - Ons Geld | Maak ons geld stabiel, dienstbaar en democratisch. Martin Wolf, commentator in de Financial Times (FT) schreef dit artikel in de Financial Times van 25 april. Hij schrijft over de nood om staatsgeld te introduceren en het privilege van geldcreatie af te nemen van private banken. I explained how this works two weeks ago. Banks create deposits as a byproduct of their lending. In the UK, such deposits make up about 97 per cent of their money supply. Some people object that deposits are not money but only transferable private debts. Yet the public views the banks’ imitation money as electronic cash: a safe source of purchasing power. Banking is therefore not a normal market activity, because it provides two linked public goods: money and the payments network. On one side of banks’ balance sheets lie risky assets; on the other lie liabilities the public thinks safe. This is why central banks act as lenders of last resort and governments provide deposit insurance and equity injections. It is also why banking is heavily regulated. Yet credit cycles are still hugely destabilising. What is to be done? A minimum response would leave this industry largely as it is but both tighten regulation and insist that a bigger proportion of the balance sheet be financed with equity or credibly loss-absorbing debt. I discussed this approach last week. Higher capital is the recommendation made by Anat Admati of Stanford and Martin Hellwig of the Max Planck Institute in The Banker’s New Clothes. A maximum response would be to give the state a monopoly on money creation. One of the most important such proposals was in the Chicago Plan, advanced in the 1930s by, among others, a great economist, Irving Fisher. Its core was the requirement for 100 per cent reserves against deposits. Fisher argued that this would greatly reduce business cycles, end bank runs and drastically reduce public debt. A 2012 study by International Monetary Fund staff suggests this plan could work well. Similar ideas have come from Laurence Kotlikoff of Boston University in Jimmy Stewart is Dead, and Andrew Jackson and Ben Dyson in Modernising Money. Here is the outline of the latter system. First, the state, not banks, would create all transactions money, just as it creates cash today. Customers would own the money in transaction accounts, and would pay the banks a fee for managing them. Second, banks could offer investment accounts, which would provide loans. But they could only loan money actually invested by customers. They would be stopped from creating such accounts out of thin air and so would become the intermediaries that many wrongly believe they now are. Holdings in such accounts could not be reassigned as a means of payment. Holders of investment accounts would be vulnerable to losses. Regulators might impose equity requirements and other prudential rules against such accounts. Third, the central bank would create new money as needed to promote non-inflationary growth. Decisions on money creation would, as now, be taken by a committee independent of government. The transition to a system in which money creation is separated from financial intermediation would be feasible, albeit complex. But it would bring huge advantages. It would be possible to increase the money supply without encouraging people to borrow to the hilt. It would end “too big to fail” in banking. It would also transfer seignorage – the benefits from creating money – to the public. In 2013, for example, sterling M1 (transactions money) was 80 per cent of gross domestic product. If the central bank decided this could grow at 5 per cent a year, the government could run a fiscal deficit of 4 per cent of GDP without borrowing or taxing. The right might decide to cut taxes, the left to raise spending. The choice would be political, as it should be. Opponents will argue that the economy would die for lack of credit. I was once sympathetic to that argument. But only about 10 per cent of UK bank lending has financed business investment in sectors other than commercial property. We could find other ways of funding this. This will not happen now. But remember the possibility. When the next crisis comes – and it surely will – we need to be ready.